Mindoxidil 5% is considered the standard treatment for Hair Regrowth for over 20 years. A of Extra Strength 5% Kirkland Minoxidil Formula which regrows more hair then the 2% minoxidil formula. 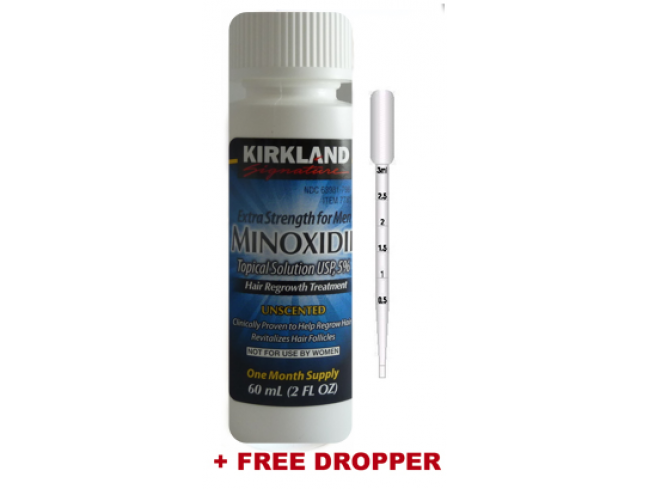 1 (2 fl oz) bottles of Kirkland Signature Topical Minoxidil Extra Strength with an long expiration date. This is a months supply. Dropper applicator and an information leaflet. The information provided above is not intended to take the place of a doctor’s advice. Use all products as directed. Half the price and as good as trade the names Rogaine and Regaine. Minoxidil 5% contains the same exact ingredients as Regaine Extra Strength at over half the price! There is no differences in composition or quality of the product. Minoxidil was the first drug approved by the American Food and Drug Administration for the treatment of androgenetic alopecia (hair loss). Before that, minoxidil had been used as vasodilator drug prescribed as oral tablet to treat high blood pressure, with side effects that included hair growth and reversal of male baldness. For the treatment of hair loss, minoxidil is available as a topical solution that is generally either 2% or 5% minoxidil in propylene glycol. The propylene glycol ensures that the applied minoxidil is evenly spread across the affected area and easily absorbed through the skin. Dermatologists conducted a 1-year observational study in 984 men with male-pattern hair loss. The study evaluated the effectiveness of a 5% minoxidil topical solution in halting hair loss and stimulating new hair growth. Over the 1-year period of the study, patients applied 1 ml of 5% minoxidil solution twice day to hair-loss areas of the scalp. The dermatologist investigators reported that hair loss areas of the scalp had become smaller in 62% of the patients. In evaluating minoxidil effectiveness in stimulating hair regrowth, the investigators found the 5% solution very effective in 15.9% of patients, effective in 47.8% and moderately effective in 20.6%. Hairs lost during washing numbered a mean 69.7 at the beginning of the study, and a mean 33.8 at the end of the study - a measure of the effectiveness of 5% minoxidil in halting hair loss in the patients studied. Side effects, mostly dermatologic, were reported by 3.9% of patients in the study. None of the side effects was classified as serious. Results may occur at 2 months with twice daily usage. For some men, it may take at least 4 months for results to be seen. The amount of hair regrowth is different for each person, it may not work for all men.